ATLANTA (Feb. 15, 2017) – More than 5,000 Chick-fil-A® restaurant franchise owners, home office employees and their spouses packed a record-breaking one million meals for food-insecure children while gathered at the company’s annual conference in Dallas on Tuesday, Feb. 14. Chick-fil-A partnered with Feeding Children Everywhere –a national non-profit organization that provides tens of millions of healthy meals for hungry children across the globe to pack the meals, which will be distributed to families with limited or uncertain access to adequate food living in 13 states around the country. The meal-packing event was part of the non-profit’s Hunger Projects initiative – a high-energy, practical way for organizations and groups to make a tangible difference in the fight against global hunger. Each meal contains balanced portions of lentils, rice, dehydrated vegetables and pink Himalayan salt, intended to serve as a sustainable addition to a child’s daily diet. The meals will be distributed over the next week to communities in Arizona, Arkansas, California, Florida, Georgia, Maryland, Mississippi, Missouri, North Carolina, Ohio, Pennsylvania, Tennessee and Texas. We did it! 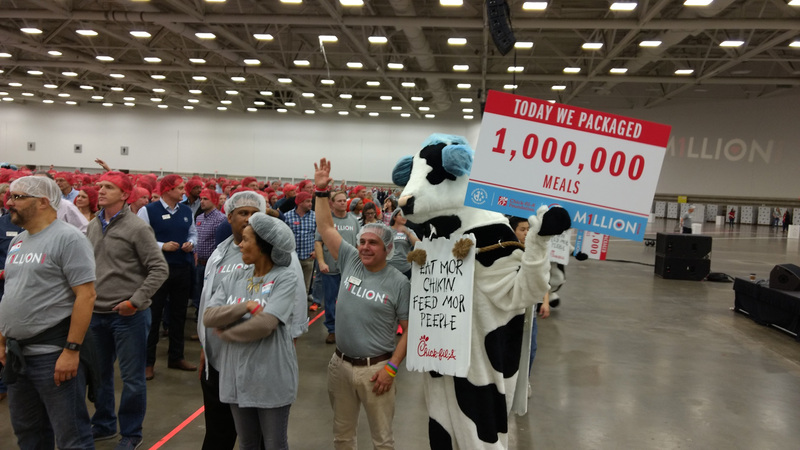 #1MillionMeals packaged thanks to team members at @chickfila! . Chick-fil-A restaurant franchisees and home office employees have packed nearly four million meals since the company first teamed up with Feeding Children Everywhere in 2014. In addition to providing meals to those in need, Chick-fil-A is also committed to supporting the Team Members who work in the restaurants. As part of the company’s commitment to giving back, this year Chick-fil-A also more than doubled its investment in Team Members’ college educations, providing $4.9 million in scholarships in 2017 alone. Since Chick-fil-A began awarding scholarships to Team Members in 1973, the company has awarded nearly $36 million to 36,000 Team Members.